This history is mainly taken from a booklet produced in 1922 by the then vicar of St Mary's, the Revd. A R Vaughan Daubeney.In the Domesday Book the name of the parish is spelt "Waltun," that is Wall farm, and there must have been a wall or earthwork from which it took this name. It has been suggested that the Devil's Dyke, which runs from Caldecot and Beachamwell. to near Narborough, may formerly have run to Walton; this dyke is described as an earthwork and is said to be pre-historic. 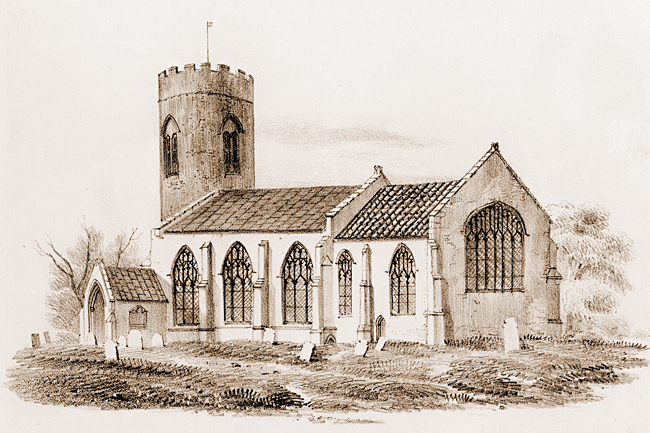 St Mary's, East Walton, Robert Ladbrooke 1800's. 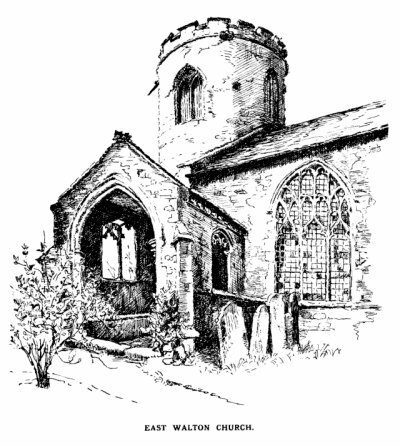 The Church, like that of Gayton Thorpe, is dedicated to Saint Mary the Virgin; both these Churches are mentioned in Domesday Book on account of their having geldable, that is, taxable land, Walton 15 acres, Gayton Thorpe 30 acres. This all shows that they must be of great age, undoubtedly pre-Norman. It is difficult to ascribe any date to Walton Church, but one can see very early work in the lower part of the walls of the nave, on both north and south sides, and the round arch over the south door inside is also early work. The tower is round with a battlemented top, but of somewhat later work than the Gayton Thorpe tower, and appears to have been added to the church and not to have been part of the original building. The south porch is in rather bad repair; within, on the right hand side of the door, can be seen a Stoup for Holy Water, though very little of it remains: this Holy Water was for the use of those entering the church, to be used as Doctor Cox says in his book on Church Furniture "as a symbol of the purity of soul with which they ought to approach the place where His Majesty dwelt." There are three very fine windows on both the north and the south side of the nave; the tracery is beautiful, they still have the old lead work and small squares of glass which in so many cases have been replaced by modern diamond-shaped panes. There are nine corbels for the support of beams from the roof, but as the Church was at some time ceiled for the sake of warmth, there are no beams now resting on the corbels: some of these heads are in excellent preservation, one or two are perhaps rather grotesque, ending up with a demon at the bottom of the church by the door —a most unmistakable demon with horns and mouth agape showing a row of teeth. The chancel arch has been filled in with plaster and a wooden arch, but the fine dimensions can be seen and also the top of it, which is beautifully carved, from the chancel side. 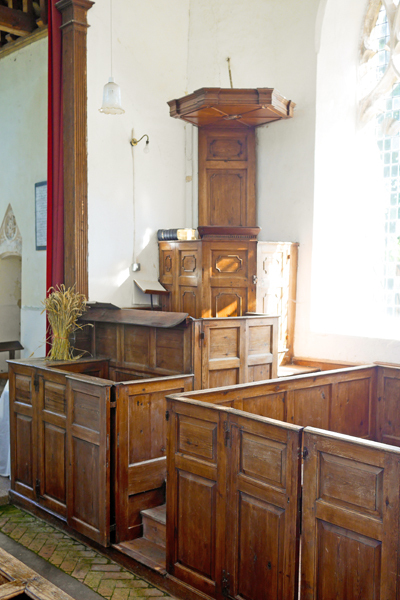 The old-fashioned high pews and the lofty "three decker" pulpit with its sounding board are all in keeping with the date of the false arch and ceiling and are now not often to be seen. At the back of the pulpit are the remains of the staircase leading to the Rood-loft, but this can be better seen from the outside of the church, where there are two small arches on either side of the buttress; these have been supposed to lead to vaults, bhas a small wooden shelf above the basin, known as a credence shelf, for the purpose of placing thereon the bread, wine, and cruets for use at the Holy Eucharist. On the floor of the nave, close to the chancel arch, lies a large slab with a brass measuring 14¼ by 2¼ inches, bearing the following inscription: —ut this is a mistake as they are for the support of the staircase: this stairway proves that there was a Rood-loft and screen across the chancel, to divide it from the nave. The Rood-loft was just a narrow gallery which gave ready access to the Rood or great Crucifix for purposes of cleaning and repairing when necessary and for lights at the great festivals, also it was used for a music gallery. In former days lights were not used for the practical purpose of following the services, but on Festivals certain parts of the church were illuminated, and out of devotion to the Rood the Rood-beam must have been ablaze with candles, so much go that it was sometimes known by the name of the "Candle-beam." i.e., "Pray for the souls of William Bacar and Margaret his wife: on whose souls God have mercy. Amen." The Baker family must have lived in Walton for many generations, as down to about 1600 their name appears several times in the old register. William Baker the elder of East Walton, in his will dated 4th March, 1490, left directions for his burial in the Church of Our Lady at East Walton "before the chauncell doore by the sepultur of my wif": there is no date on the brass but it is probably the same William and the "chauncell doore" refers to the doorway through the screen from the nave. 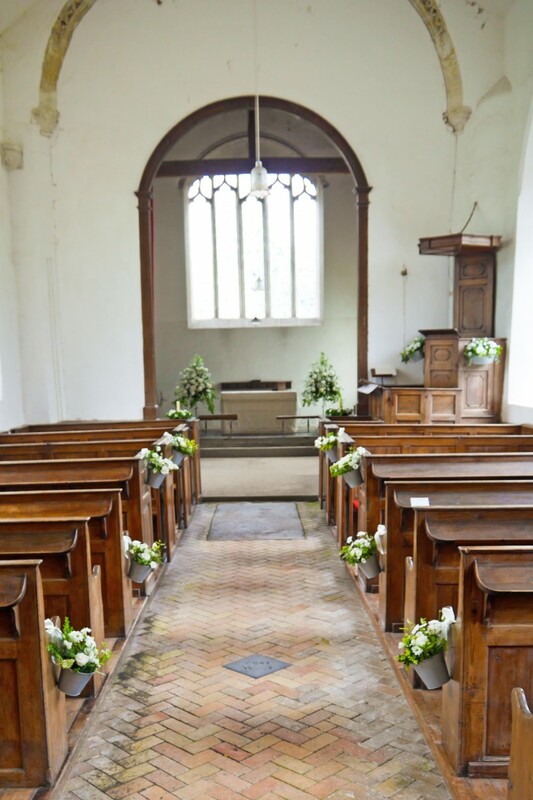 In the same will he leaves 6/8 to the Vicar of East Walton for tithes forgotten; 20/- for the reparations of East Walton Church; 13/4 to Hyllyngton Church; 6/8 to Congham Church; 3/4 to Grymston Church; he also desires that a priest may sing for his soul in East Walton Church for a year after his decease. In the Sanctuary are four large black marble slabs to the memory of the family of Lord Richardson, 5th Baron of Cramond; this family at one time lived at Westacre High House and intermarried with the Barkham family. These slabs, with others in the chancel, were moved here from Saint Andrew's Chapel, the ruins of which can be seen in Mr. Knight's garden. Underneath the chancel is what is generally known as the "bone hole," being the place used for the disposal of bones dug up in churchyards by fresh interments, a thing which must continually happen in a churchyard as ancient as this one; every church had a bone hole of some description, a most reverent custom now long fallen into disuse. The one belonging to this church is sealed up, but it was to be seen when the chancel was being restored several years back. 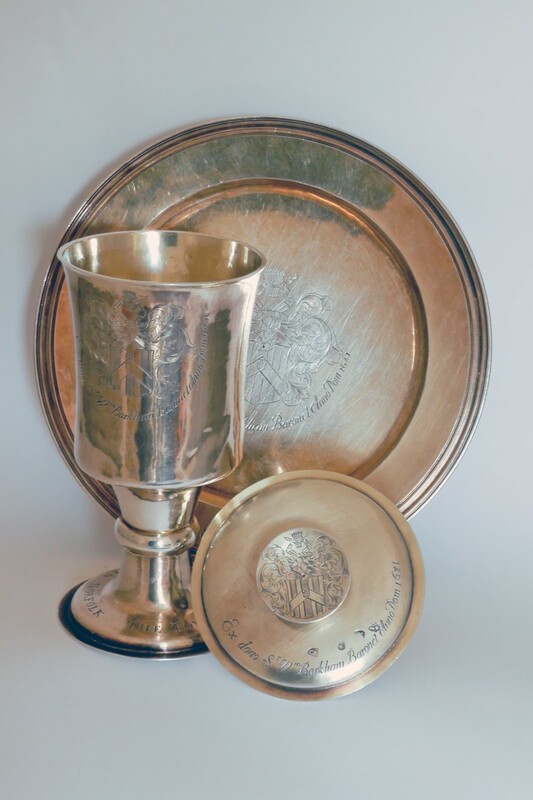 The Communion Plate consists of a chalice, silver gilt, 8¼ inches In height, with a cover, and a paten or dish. These are in excellent condition, they bear the arms of the Barkham family, and are inscribed "The Towne of East Walton in Norfolk." "Ex dono Sr Wm Barkham, Baronet." "Anno Dom: 1681." There is one bell, but L'Estrange in his "Church' Bells of Norfolk" says that it has no inscription on it. It is not possible to examine this bell owing to the state of the woodwork in the tower. His friends and all who knew him justly can And truly say, here lies an honest man. There are also several stones evidently brought from the ruins of Saint Andrew's Chapel next door, which have been roughly engraved and set up as tombstones. Nothing appears to be known with any certainty about the Chapel of Saint Andrew except that it was in existence before 1322, probably long before, but being within about a stone's throw of the Parish Church, it could hardly have been a Chapel of Ease, as is sometimes suggested. The Vicar of East Walton is Vicar of both Saint Mary and Saint Andrew. I cannot find mention of any Religious House, Cell, Anchorage, or Hermitage here to account for the Farm being now called the Abbey Farm. 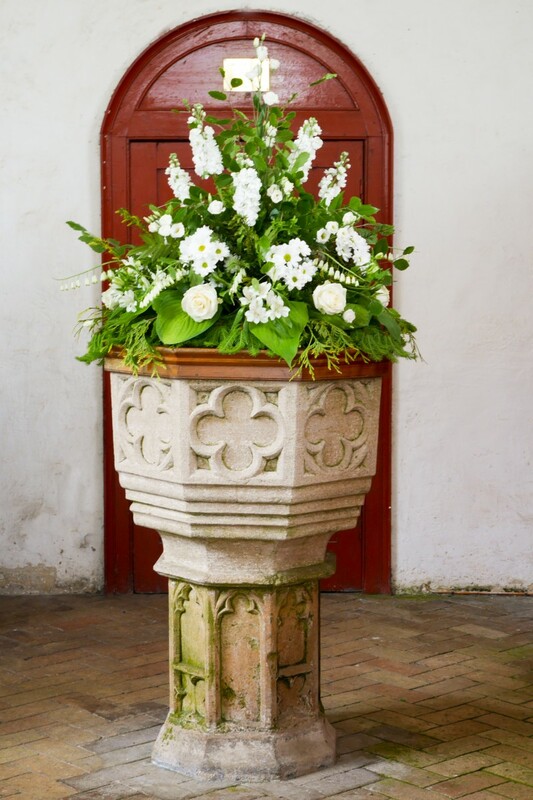 No doubt the name arose from land in the parish formerly belonging to West Dereham Abbey, which would naturally be referred to as Abbey land or the Abbey Farm. Old leases speak of Walton Hall and Walton Hall Farm, and I take it that Walton Hall was the mansion house of the Baker family in olden days and later of the Barkhams and the Richardsons, and probably it stood partly in Fen Close, where one can still see what are sometimes called groundsells, i.e., foundations. George William Lemon, who was Vicar here for forty-two years, was at the same time, for ten years, Head Master of Norwich Grammar School; and then for seventeen years Vicar of Seething, near Norwich. In conjunction with Edward Spelman, his patron and former pupil, he wrote "A History of the Civil Wars of York and Lancaster," which was published at Lynn in 1792; he also was the author of several educational books; both he and Mr. Spelman were men of learning. It may be interesting to know that one of Mr. Lemon's pupils at Norwich Grammar School was Horatio Nelson, the great Admiral. After Mr. Lemon's death the parish fell on rather evil times, as the living was held in conjunction with Gayton Thorpe and Westacre by Martin Coulcher, who, had also a school and clerical work at Wisbech. Mr. Coulcher was a Justice of the Peace and a most worthy man; later he was appointed Head Master of the King's Lynn Grammar School, but his parishes were left to the tender mercies of a curate, with not over happy results, and from Mr. Lemon's death in 1797 until 1882, the year Mr. Keppel was instituted, there was no resident Vicar. There is a mural tablet in the Church here to the memory of Mr. 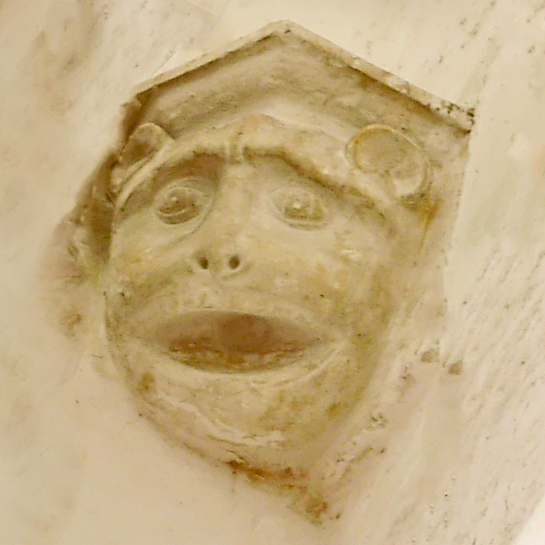 Lemon, but Mr. Coulcher lies buried in Gayton Thorpe Church, where is a slab and also a mural tablet to his memory. In W alton Church also, at the west end, are the Royal Arms of George III. before the Union with Ireland (1801), as can be seen by the Lilies of France being quartered there. 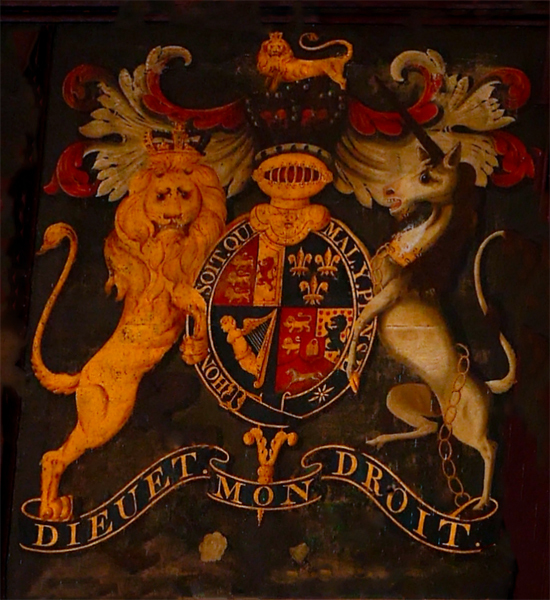 At the Restoration of the Monarchy in 1660, placing the Royal Arms in churches became compulsory, presumably to promote loyalty. Formerly the Church of East Walton was a Rectory, but when the Prior of Westacre became Patron, a Vicarage was settled and the Prior, as Rector, took the great tithes, i. e., tithes on corn, hay and wood; after the dissolution of the monasteries it passed through several hands, and the Rectory of East Walton is now vested in the Ecclesiastical Commission, who hold the great tithes and as lay-Rector are responsible for the upkeep of the chancel; in the case of Gayton Thorpe, although the Priors of Pentney for a considerable period were patrons, for some reason no Vicarage was settled and it has always been served by a Rector. Perhaps it is not generally known that a Rector only is entitled to the name of Parson (Latin Persona i. e., The Person), so called because he is the person representing the Church. It is an ancient and honourable name; vicars, assistant curates, and clergy other than rectors, strictly speaking, are not Parsons. I have, therefore, the distinction of being the Parson of Gayton Thorpe but not of East Walton. The annual payment of Peter's Pence was 8½d. for this parish and 8d. for Gayton Thorpe; this money was known as "Smoke Farthings," "Whitsun farthings," or "Pentecostals." A tax of a penny or less on each hearth was collected from Saxon times on Saint Peter's day and sent to support the English College in Rome, hence the name Romescot or Peter's Pence. In the Tithe map I find that the three fields on the east side of the road leading from the "Walton Greyhound" to the Church are called Camping Land, Little Camping Land, and Great Camping Land; Forby, in his "Vocabulary of East Anglia," gives an account of the game of camping as it used to be played; it was a kind of football. "Two goals are pitched at the distance of 120 yards from each other; in a line with each are ranged the combatants, for such they truly are, the number in each side is equal, very commonly twelve; the ball is deposited exactly in the midway; the sign or word is given by an umpire, the two sides rush forward, the sturdiest and most active of each encounter those of the other; the contest for the hall begins and never ends without black eyes and bloody noses, broken heads or shins and some serious mischiefs." It might more easily be described as a free fight. I believe every parish had its Camping Land and in many, as at Gayton Thorpe, East Walton, and Swaffham, the name still remains. Another interesting name in the Tithe map is that of "Gallows Hill." The Prior of Westacre and also the Abbot of! West Dereham, had what was called the "Eight of Gallows" in East Walton, and since from time to time human bones are dug up there, it is not unreasonable to suppose that this hill is where executions took place under their orders. In these more enlightened days it seems a dreadful thing that an Ecclesiast should have and should use this power. One other name is worth noting, "Summer End"; this is a contraction of South Mere End; evidently there was some large piece of water lying either in or near that part of the parish; there was also a South Mere Street in East Walton. I notice that there were "Concealed Lands" in East Walton belonging to Pentney Priory; they were granted by Queen Elizabeth to John Dyer and Henry Cressener on 10th April in the 16th year of her reign. Neal, in his "History of the Puritans," states, "About this time (1582) the Queen granted a Commission of concealments to some of her hungry courtiers, by which they were empowered to inquire into the titles of Church lands and livings; all lands for which the parish could not produce a legal title were given to them." Neal ends up by remarking that it is well enough known the Queen had no scruple of conscience about plundering the Church of its revenues; possibly so, but then Neal did not love either the Church of England or the Church of England's Supreme Governour, as Elizabeth called herself. Beyond the Church still stands the old Church School, used now as a Reading-room. The last mistress there was a Mrs. Moore; there are several people in the two parishes who used to attend her school, and I have heard said that the mistress hand was rather heavy; no doubt there was good reason for it. There are three Parochial Charities —(1) The Callibut Charity. On the 29th April, 1509, Francis Callibut assigned to trustees, lands in Grimston containing about 31 acres, the rent of which is to be paid and applied by the trustees on Saint Thomas' Day (December 21st) in every year for the poor and most needy inhabitants of the towns of Hillington and East Walton (one moiety to each parish); to be distributed amongst them in money according to the number of heads in each family or as occasion shall better require. (2) Hopes Charity. The Reverend Thomas Hopes, Rector of North Runcton, by will dated 1615, left a portion of the tithes called Notley Tithes, amounting to 3/4 per annum, for the poor of East Walton. (3) Poor's Land Charity; amounting to £4 per annum from Consols. This was formerly a charge on the estate and according to ancient custom is distributed in twelve loaves of bread each fortnight. In 1919 a brass was put up in the Church, by voluntary subscription, to the memory of those who fell in the Great War. Revd. Daubeney does not say how much the Church was remodelled in the 18th century, nor sadly, does he mention the very spendid 14th century font that remains. It is shown here, beautifully decorated, for a very special family wedding.